As humans, we experience emotion on a vast spectrum. Sometimes our feelings can be described in simple words: joy, love, pain, or sorrow. Other times, it seems as if there's not one word in any language that could come close to describing how we feel. The 9/11 Memorial and Museum is a tribute to the men, women, and children who lost their lives during the attacks on September 11, 2001, and February 26th, 1993. It is a physical reminder to ensure future generations understand what happened. The memorial consists of sunken twin pools set within the very foundations of the Twin Towers. The names of every person killed in the attacks are inscribed in bronze, and form the tops of the walls that encase each pool. A peaceful waterfall cascades down all four sides of the pools. The memorial has been described as deeply moving, gripping, and peaceful. The memorial itself is free to visit, but tickets are required to enter the museum. Photography is permitted at the memorial, but visitors are asked to respect the space as it is a memorial commemorating the victims of the attacks. There are many mobile apps that can be downloaded to enhance your museum experience, and a Memorial Commemorative Guide can be printed beforehand to use as reference when exploring the memorial. It's recommended to buy tickets online and ahead of time. Museum tickets are $24 for adults, $18 for seniors (65+), students, and US veterans, and $15 for children (7-17). New York CityPASS provides general admission to the museum in a package deal, and is a great option for anyone who wants to visit the city's other great destinations. Tickets can also be purchased from the 9/11 memorial website up to six months in advance. The museum audio guide is a downloadable app that offers visitors a self-guided tour featuring stories of 9/11 and the recovery days following. The audio guide also provides insight into the construction of the memorial and shares 9/11 Memorial and Museum facts. The Explore 9/11 app provides visitors with the history of the World Trade Center and details about the artifacts that live within the museum. The motion-sensitive app allows users to explore the museum by rotating their device to experience the exhibits with interactive content: photos, videos, and audio. From Sunday through Thursday, the museum is open from 9am to 8pm with last entry at 6pm. On Fridays and Saturdays the museum is open from 9am to 9pm, with last entry at 7pm. Last entry times ensure that you'll have enough time to appropriately visit the museum, as this is not something that should be rushed through. The memorial is open to the public daily from 7:30am to 9:00pm. On September 10th, the last public entry to the memorial and museum is at 3:30pm. From 4pm on, the memorial and museum are open for the 9/11 community. On September 11th, the 9/11 Memorial and Museum is closed to the public but open to 9/11 family members from 7:30am to 8:00pm. The memorial reopens to the public at 3pm and remains open until midnight for the annual Tribute in Light. The Tribute in Light shines two beams of blue into the night sky to represent the loss of towers but, more importantly, what the loss of those towers meant to the victims' families and the nation as a whole. This tribute is the most powerful light projection on Earth. Admission to the memorial is always free of charge. Admission to the museum is free Tuesday evenings from 5pm to 8pm. The last admission is two hours before closing; however, limited quantities of these tickets are available. Four tickets are allowed per person. Family members of 9/11 victims and first responders and recovery workers will always have free admission to the museum. Visitors far and wide have come to see the memorial that rests where two towers once reached great heights. Beyond the memorial itself, the 9/11 Memorial and Museum holds unique memorabilia and artifacts that tell the story of those individuals who lost their lives on that somber day. Though many of the exhibits within the museum bring about a sense of grief, there are also stories that remind the world of the power tragedy holds in bringing people closer together. The beautiful commemoration to these unique individuals allows visitors to put a story and a photograph to the names. Through each artifact and seemingly ordinary object, you'll uncover the intimate details that make each item so important in relation to the events that took place either at the North or South World Trade Center Towers, the Pentagon, Flight 11 (1993 attack), Flight 175, Flight 77 and Flight 93. The historical exhibitions exist within the original footprint of the North Tower. The exhibition is split sequentially into three parts: Before 9/11, the Events of the Day, and After 9/11. Before 9/11 brings visitors back in time to examine the World Trade Center before its collapse. It addresses what the World Trade Center symbolized, why it was targeted, and examines the attack on February 26th, 1993. The Before 9/11 part of the exhibition delves into the rise and evolution of al-Qaeda and the formation of the 9/11 plot that became an unfortunate reality. The Events of the Day brings visitors back to September 11th, 2001, as the day unfolded. It offers a deeper look into what was happening on the hijacked planes, at the Towers, at the Pentagon, and with the brave first responders. This facet of the exhibition also touches on the immediate impact the events had on people near and far. 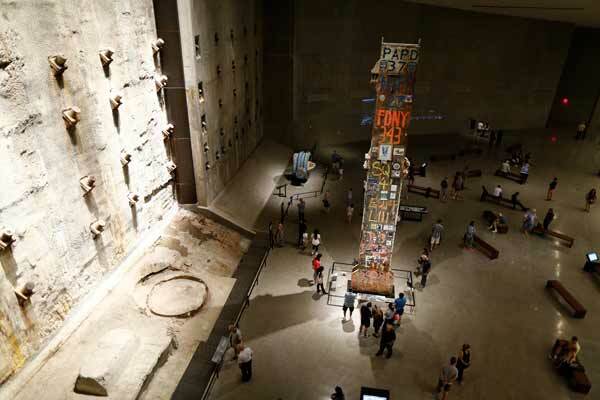 After 9/11 imbues visitors with a sense of hope. Here, visitors can see how tragedy can create a sense of togetherness and ignite beautiful acts of compassion and public service around the country and the world. This aspect of the exhibit explores the recovery efforts made shortly following the attacks and the longer road of recovery and rebuilding hope. This part of the exhibit also addresses the ongoing effects the tragedy had on the health of first responders and volunteers, and the lasting impact the events had on national security. It's important to be aware of the impact the contents of the memorial and museum will have on you. Seeing each story brought to the light of day can evoke dormant emotions, maybe even a deeper sense of connection to the tragedy. In the museum's recording studio, you'll get a chance to say how the 9/11 attacks changed or affected you that day and how it impacts you even now. Here you can also listen to and watch an archive of interviews with government officials, journalists, the family members of victims, emergency responders, and previous museum visitors. Stephane Sednaoui is a French photographer and director who witnessed the attacks and subsequent collapse of the World Trade Center from the roof of his building in lower Manhattan. Following the tragedy, Sednaoui was one of many who used his time to volunteer in the rescue efforts. When not searching through the rubble, Sednaoui captured more than 500 pictures between September 12th and 16th that reveal a deep sense of community that rose from the ashes of such tragedy. You can see his photos on display at the Witness at Ground Zero exhibition. This exhibit is a 270-degree media installation that offers a time-lapse look at the rebirth of Ground Zero, where rubble was cleared to transform the space into something remarkable, reflective, and commemorative. Project Rebirth is the nonprofit organization behind the inspiring installation and "Rebirth at Ground Zero" is on view every 15 minutes. 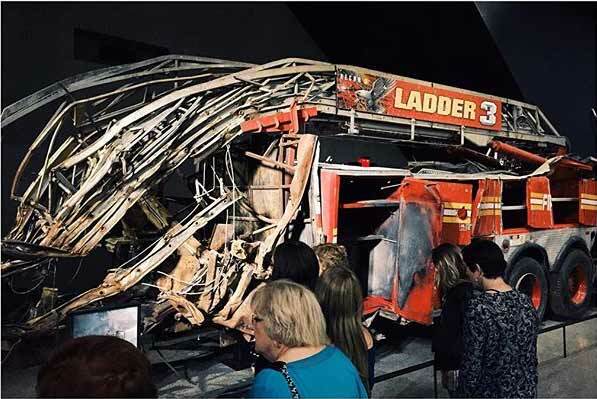 The 9/11 Memorial and Museum has a number of rotating exhibits that act as an important reminder of the lasting impact the tragedy has had on artists, photographers, journalists, writers, and individuals of all walks of life. On view now is the exhibit, "Cover Stories: Remembering the Twin Towers on the New Yorker." This exhibit follows the evolution of how the Twin Towers were depicted on covers of the New Yorker before September 1st, 2001, and how the local and national sadness affected New York and ultimately, the covers of the New Yorker over time. This exhibition runs through May of 2018. On view until January 2018 is the exhibit "Rendering the Unthinkable: Artists Respond to 9/11." Here visitors will see a collection of artwork by 13 artists that expresses their feelings about the tragedy. While children are welcome inside the 9/11 Memorial and Museum, the museum exhibitions may not be appropriate for children under the age of 10. It may also be difficult to properly explain the events of 9/11 and their impact to young children. The 9/11 Memorial and Museum provides a guide for children, and staff is available to help answer questions. It's recommended that you allow yourself at least three to four hours to fully embrace the memorial and the contents of the museum, as the experience is very emotional. Some find the museum to be overwhelming; however, many have attested that its deep impact is part of what makes the museum and memorial so necessary. Finding the right tone when creating a museum around a day so tragic is difficult, but many feel that the museum appropriately creates an informative and touching experience that pays tribute to the victims and the emotions the nation felt on that day, the days following, and even now.